Here you can see all our offers. Remember that in Gran Paintball Madrid we NEVER make you play with other groups that you don’t know anything about and you will ALWAYS have at least one instructor just for you. Unique equipment not offered by any other Paintball in Spain: Anti-fogging double lens mask – Camouflage Military Suit with neck protector – Camouflage protective vest – Gloves – Semi-automatic Marker Bravo Tactical. – NEW! Professional camouflage belt with holster and integrated space for the air cylinder (which is connected to the marker by means of a cable!). Compressed air bottle (higher quality than CO2), unlimited air refills – 100 Ball Charger – Civil Liability Insurance and Accident Insurance. Individual Extra Refills of 100 balls: 6€. Extra Refills of 100 balls if the whole group purchases them: 5€. You play for free with premium stuff if you bring 11 friends!! 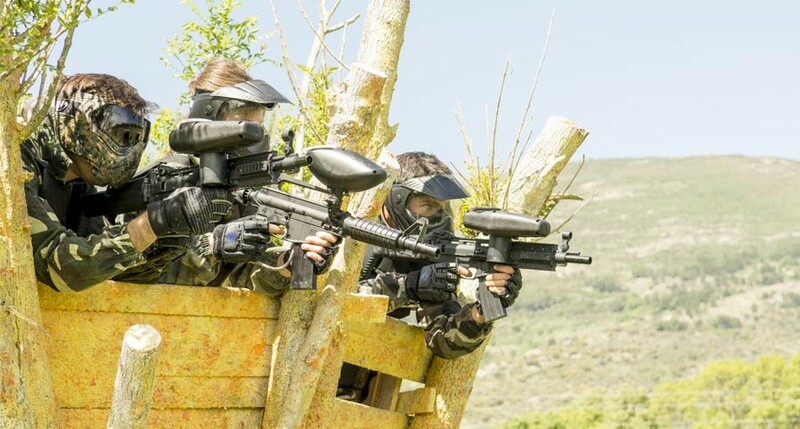 With this offer one person plays for free if 12 people or more come, with the same offer of Paintball that the rest of the group takes (Barbecue, Open Bar and other activities not included). If within the group you have taken several offers, you will play for free with the lowest offer that has been taken. This Offer includes everything you need to play: Premium Material with Bravo Tactical marker, mask, camouflage suit, gloves, camouflage vests, camouflage belt and remote cable bottle-marker, with 100, 200, 300, 400 or 500 Balls depending on the offer taken by the group. Simply Amazing! PREMIUM Equipment Rental, Civil Liability Insurance, Accident Insurance. Unlimited soft drinks and beer (90 minutes). In order for this offer to be valid, the entire group must adhere to it. Premium equipment with the Offer of balls that you choose. Extra Refills of 100 balls: 6€. Don’t be fooled by other Paintball fields; in a game of Paintball the average is to spend a minimum of 300 balls per person. Payment will be made in cash on the day of the game, or previously by bank transfer.